NWICG is a partnership of researchers and educators at Purdue University-West Lafayette (Purdue), Purdue University-Calumet (Calumet), and the University of Notre Dame, that couples mutual interests among the three campuses with national science and research initiatives, builds a cyber-infrastructure that supports the solution of breakthrough level problems, and enables continuing world-class advances in the underlying technologies of high performance computing. 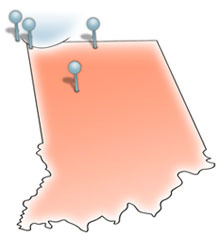 Funding for the grid was secured largely through the efforts of U.S. Rep. Pete Visclosky D-Ind., who represents the Northwest region of Indiana, which includes the Purdue Calumet campus. Visclosky is the current chair of the DOE appropriations committee, and sees this funding as key to the continued success of Indiana’s growing high-tech economy. “In order to build a new economy, we must have the high-technology infrastructure in place to attract the jobs of the future,” Visclosky said. Our approach begins with building a scalable, high speed, high bandwidth, science-driven computational grid for Northwest Indiana across the three universities in partnership with the Department of Energy’s Argonne National Laboratories. This connectivity will build on existing collaborations between the three universities and DOE, and will leverage federal investments made by the National Science Foundation in its TeraGrid program of which Purdue is a funded member, and in the recent commissioning of “dark fiber” assets between Notre Dame and Argonne. The build-out of the cyber infrastructure at Purdue is being led by ITaP’s Rosen Center for Advanced Computing under the lead of Dr. Gary Bertoline. Available network, computational, storage, visualization, and data resources, as well as specialized facilities, will be expanded, integrated, and shared among the partnering institutions, thereby providing opportunities to energize and connect the research communities, and to promote new scientific knowledge environments in ways not previously possible. At the inaugural workshop in May of 2005 at Purdue, a broad cross section of projects were presented by the three universities and by Argonne. A second workshop in August at Notre Dame further deepened the partnership. Some of the research projects that are engaging the infrastructure were presenting at the inaugural workshop. The following are examples. Purdue is a key player in the compact Muon Solenoid experiment, an international effort in high-energy physics with extreme demands on data storage and retrieval. The experiment searches for the Higgs boson, an elusive particle postulated by the Standard Model of subatomic particles. 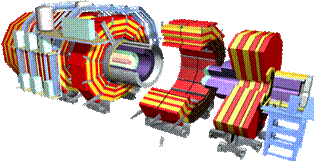 It is hoped that the Higgs boson will be discovered during extremely high-energy collisions of protons. The experiment will begin to generate data at the rate of 1 peta byte (1015 bytes) per year beginning in 2007. As a Tier-2 center, Purdue will accept a significant fraction of that data and make it available to the Physics community in the Midwest. 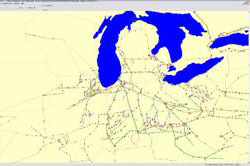 Another research project will investigate the use of the NWIC Grid to monitor in real-time the Midwest power grid and develop predictors and new state estimators. Currently, electrical power generation and distribution are being pushed to the limits by demand, from large corporate customers such as the blast furnaces of the steel industry in Gary, IN, as well as the growing demand from the residential customers. The addition of new generation and distribution capacity is a difficult process that requires not only large investments but also many environmental and energy policy considerations. Therefore, the electrical grid needs to be run more efficiently. This research project develops the tools needed to increase the efficiency of the grid by better predicting demand, by monitoring power flow and distribution, and by accounting for factors such as the weather that influence demand and transmission capacity. Biometrics and retrospective surveillance is another research project that will utilize the grid. With security considerations in focus since the events of 9/11, research is progressing to include biological characteristics into the measurements comprising identification and surveillance parameters. They include facial characteristics, finger and palm prints, video footage, and more. Novel algorithms and measurement strategies must be evaluated in the context of large and representative data sets to assess their utility, reliability, and, in particular, scalability. Small data sets, appropriate for the laboratory settings of university research, typically are measured in tera bytes (1012 bytes) and must be accessed quickly.